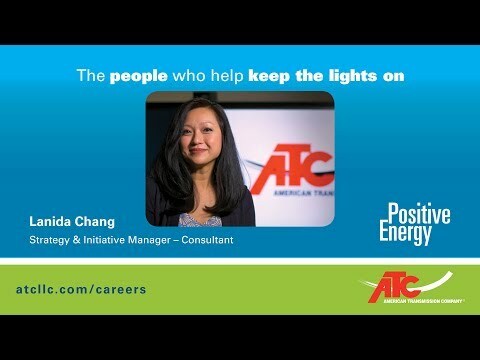 The people who help keep the lights on: Lanida Chang, Consultant Strategy and Initiative Manager | American Transmission Co.
Lanida Chang, consultant strategy and initiative manager, says she loves what she does because she knows she adds value. In her role, she helps to drive core initiatives within American Transmission Co.’s operations department that improve ATC’s ability to reliably, effectively and safely deliver power. “I feel very fortunate that I’m able to do something that I love and enjoy doing,” said Chang. Chang works with ATC operators, who operate the grid in real time from ATC’s control center. Operators help move electricity from where it’s generated to where it’s needed through ATC’s network of transmission infrastructure. “System operations is really the core of ATC. It’s what runs the electric grid. Those are the people behind the scenes that make everything work,” said Chang. Chang says she sees ATC’s role as much more than just helping to keep the lights on – reliable energy delivery helps to power communities and even save lives. “I know that when businesses are running and that when people are in hospitals, they need the electricity to work – that’s us. That’s us providing that,” she said. Chang says she’s looking forward to continuing her growth with ATC. If you would like to grow your career with an organization with plenty of positive energy and colleagues like Chang, check out our careers page to search open positions.